Students at Bishop Ludden Junior/Senior High School recite the Pledge of Allegiance while gathering in “House” each morning. The House system provides students with leadership, camaraderie and community service opportunities. Peter Cappuccilli, ’68; Pat Donnelly, ’76; Tim Murphy, ’82; Steve Infanti, ’94, Colleen Sierotnik, ’01. These are just a few of the alumni that Bishop Ludden Junior/Senior High School has named its “Houses” after in a recently established program to give students a greater sense of belonging and responsibility, while providing leadership, camaraderie and community service opportunities to its 402 students in Grades 7 through 12. 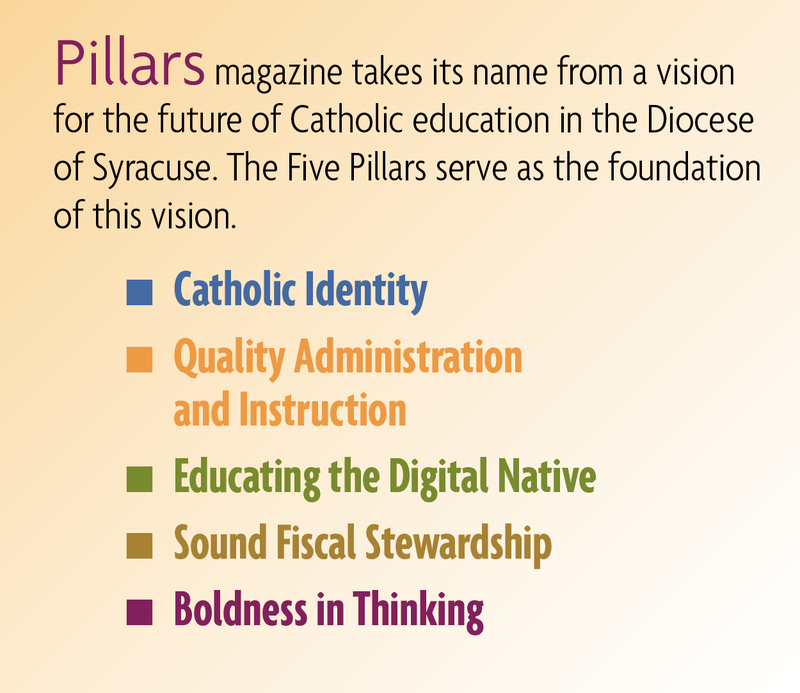 The program was created by Bishop Ludden faculty in the summer of 2008 and refined by staff with funding from a Heritage Program Enhancement Grant given that year through the Catholic School Office’s Endowment Fund. Instead of attending traditional homerooms, Bishop Ludden students now are assigned to one of 35 Houses consisting of nine to 13 students. Students meet in “House” for both a 32-minute morning session, which allows time for activities to take place, and a shorter period in the afternoon. Each House has a housemaster, who will lead his/her house for a two-year term. After the two-year term, the House will be passed on to another Housemaster during a special ceremony. The alumni namesakes participate as House stewards. The alumni represent all decades of the 46 years since Bishop Ludden opened, and many House stewards have children of their own now attending the school. Each House steward has made a commitment to serve the system for a pre-determined length of time — from 1 ½ to 6 ½ years — depending on the grade level he/she chose. According to Czarniak, Houses are expected to participate in both service and spiritual activities and many of the Houses have adopted not-for-profit agencies in this area. In morning House, students have made Halloween treat bags for the children at the McMahon-Ryan Child Advocacy Site and have collected gloves and mittens for the Rescue Mission, for example. 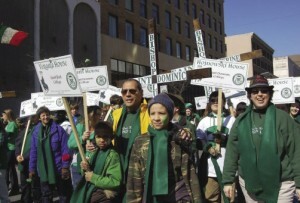 Houses also participate in activities outside of the building and have tutored students at the Bishop’s Academy at St. Charles and walked in the annual St. Patrick’s Day Parade. Prayer services, morning masses, rosary recitations and Stations of the Cross also are part of the experience. In addition, each House also is a member of a “College” within the building. Colleges, which are named for saints, are made up of one house from each grade level. All students in a college share the responsibility for the academic success of each individual within that college. This system also allows for students at the high school level to act as peer leaders and mentors to those students at the junior high level. Proudly holding signs representing their Houses, Bishop Ludden students and faculty march in the Syracuse St. Patrick’s Day Parade. In addition to the academic, spiritual, and service benefits, the House system also has created an esprit de corps among students in their Houses and Colleges. Each spring, the Houses and Colleges participate in spirited competitions at the traditional Ludden Day festivities. The winning College and Houses are honored by having their names engraved on trophies, which they “own” and display until the next year’s competition. Maria Walsh is the director of development at Bishop Ludden Junior/Senior High School.